A further 36,000 people will need to be evacuated from the Far East as floodwaters in the area continue to rise, Deputy Prime Minister Yuri Trutnev said Tuesday. Almost 16,000 people have already been evacuated and 98,800 people have been affected by the ongoing flooding on the Amur River, Trutnev told Prime Minister Dmitry Medvedev Tuesday during a meeting. “Flooding in Khabarovsk is expected to peak between September 6 and September 9 and in Komsomolsk-on-the-Amur between September 11 and September 15. It’s an absolute historical record,” Trutnev said, according to a transcript published on the government’s website. Trutnev was appointed as a deputy prime minister and presidential envoy to the Far East by President Vladimir Putin on Saturday, the same day that Viktor Ishayev was dismissed from his position as Far East Development Minister, in a move that Putin described as "planned" and "not connected" to the floods. 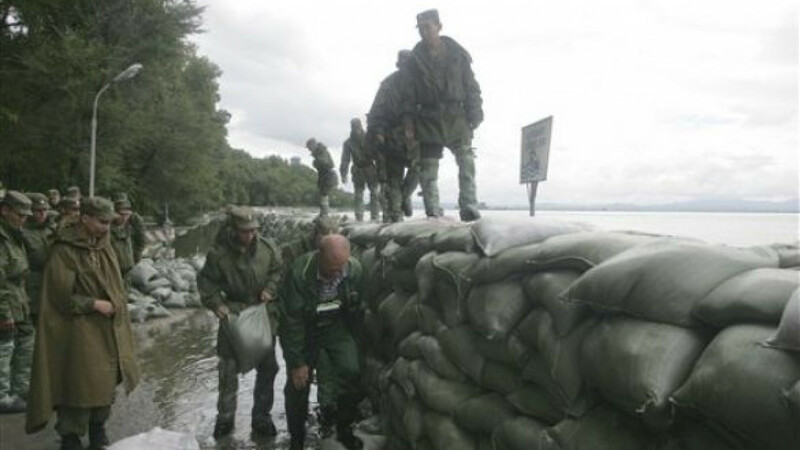 The Khabarovsk Region, Amur Region and the Jewish Autonomous Republic have been hit hardest in the floods. The floodwaters are not expected to abate significantly before the end of September or early October. About 45,000 people are taking part in rescue work, including 11,000 people from the Emergencies Ministry, Trutnev said. The far eastern city of Komsomolsk-on-the-Amur, where water levels have already risen by 820 centimeters, is in particular danger, according to Trutnev. The city is home to about 300,000 people and is an important manufacturing center for Russia’s aviation industry. The World Wildlife Fund said Monday that the long term causes of flooding in the Far East were the chronic mismanagement of forest ecosystems and water basins, as well as climate change.